Sometimes it takes two tries to get it right, even for Criss Angel. He and Cirque du Soleil had planned a show combining Cirque’s incredible artistry and their expansion upon the craft of clowning and Angel’s incredible illusions. The first try fell a bit short of expectations. But now Criss Angel tickets for Criss Angel Believe are a must for those who loved the program Mindfreak and would not mind a little vacation in Las Vegas while being entertained by a live staging of the show. Upon discovering Criss Angel and Cirque du Soleil were embarking on a Las Vegas production fans, critics, and resort entertainment directors alike were eagerly anticipating the result. Well, the first show had a little too much filler and a little much flash going on behind the magician. While a magician relies on sleight of hand and distractions, those distractions cannot overwhelm the audience. So they returned to the very core of what would be the draw. Fans wanted to see the inventive illusions that have come to be expected from Angel and the otherworldly artistry that has become a staple of Cirque. For cirque this meant conceiving some sort of loose narrative to drive from each Criss Angel illusion to the next. This also meant the bright colors typical of a Cirque performance would have to be dialed down quite a bit. Thus, gothic scenery and set pieces were imported and the main performer was allowed to break the fourth wall, a staple of any illusionist because those who love magic want to experience and not merely watch the show. The performance is driven by the incredible illusions and the persona, one that graciously brings dark humor to this dark show. 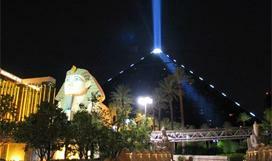 Yet, Criss Angel tickets for the Vegas show at the Luxor Theater, renamed the Criss Angel Believe Theatre, in the Luxor hotel and Casino are almost all ages, though it is advisable no one under the age of 16 attend. Tuesday through Saturday Criss Angel, his four ushers, and a number of other performers take the stage at 7 and 9:30 pm. While television shows and other stage performances are an intricate part of Angels performances, it would seem he feels most comfortable out on the streets mingling with fans and casting magical illusions before them. From levitation to literally walking on water, he has everyone in awe and screaming with mystified delight. No one can escape his easy going personality. At Vegas Tickets you can count on finding Criss Angel Tickets and tickets to all the Las Vegas Shows and Las Vegas Concerts. We are a local Las Vegas ticket broker with a local office located just minutes from the world famous strip. Vegas Tickets is a long-standing member of the NATB (National Association of Ticket Brokers), ASTA (American Society of Travel Agents), and the Las Vegas Chamber of Commerce. We have Celine Dion tickets and all the Cirque du Soleil Vegas tickets. If you can’t find what you’re looking for on our website, please call one of our professional sales reps at 877-467-4697 and we will do our best to help you.